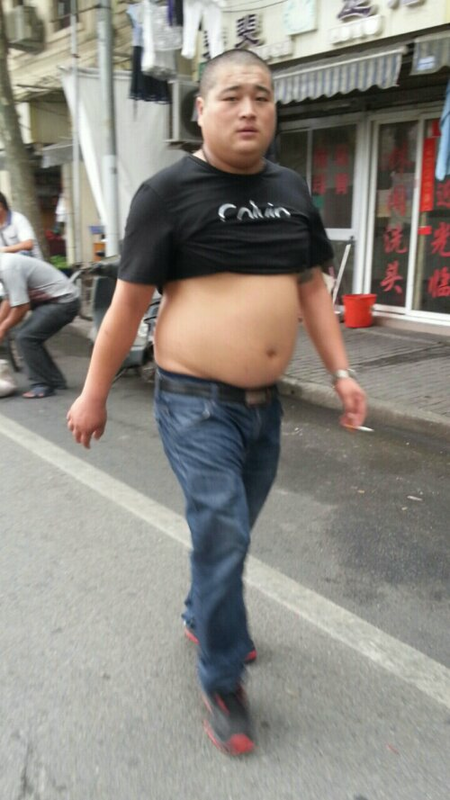 There are few things that I dislike in China more than what I call “bare bellies”. I think fat Chinese men think of their stomachs as advantageous and even functional, but in reality they are neither. I think these people reason that their fatness can hold their shirts up and they can thus help them cool down in this sweltering heat… But 1 – it’s not that hot anymore and 2 – fat people have more fat layers that can’t be removed so they will naturally be hotter. And this isn’t a hate post about fat people… It’s simply a dislike post about fat people. I mean, I certainly hold preconceived ideas about fat people, but I don’t let that preclude me from having relationships with them. But if a fat person wants to thrust his or her bare belly in my face, I reserve the right to throw up in my mouth a little. I saw this situation in china and I think is awful. I don’t like it.